One unexpected strength of the Vantage is being exceptionally good at picking up DAB+ signals even in my suburb which has fluctuating digital radio signal strength. When I took it out of its box, tuned all the stations and started testing I didn’t even notice the antenna wasn’t extended until 30min later. Before you look at any digital radios make sure you read my detailed Introduction to Digital Radio in Australia – I asked digital radio spokespeople at ABC / SBS what their offerings would be and also found out what Commercial Radio, Community Radio and several digital radio manufacturers had to say. Reception/Antenna – Second to none, far better at picking up Digital Radio broadcasts and playing them without any sound dropouts than the other digital radio’s I’ve previously reviewed. Picked up all the Sydney stations and displayed the digital radio station datastream eg: current song name, weather forecast, news headlines etc on screen. Extras – Dual Alarm Clock with Snooze Function and 10 preset radio stations of your choice. Battery or mains power as it suits you. Warranty – Generous 2 year (24 Months), most consumer electronics products only have a 1 year warranty. Connectivity (Inputs/Outputs) – Stereo Line Out and Headphone jack output. Digital Radio + FM Radio input. If you want WiFi internet radio or access to songs via shared network drive you’ll have to pay more for a different digital radio. Display & Buttons – 2 line screen is clear but it’s somewhat tedious to read scrolling text news updates or song names because the scrolling speed is so slow. The display is clear and easy to read from a distance if you change the backlight setting to “Timeout: ON” (which actually means that the timeout never happens). Make sure you turn the radio off when not in use if “Timeout: ON” because if you press Standby the screen stays backlit. Buttons – Are small and not raised enough. The button font would be easier to read if it was Sans-Serif (not slanted and italics). The buton to change stations is labelled “DAB Station”, It should have been named “Select Digital Station” or something similar because the vast majority of people don’t know what DAB is. If you want a quality portable digital radio to use outside which beats all the others at picking up all the stations clearly and has thought put into the design with a 2 year warranty than by all means buy the OXX Digital Vantage for $129.95 RRP. 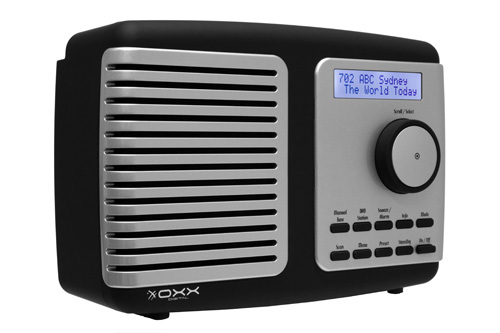 However if you don’t need portability – for $40 extra you could buy a Kogan digital radio with an unpolished design but lots more features or for $150 extra you could get the more deluxe OXX Digital Classic model with a big multi-line screen, WiFi radio, network share drive access etc. The OXX Digital Vantage is on sale at ABC Shops Online, Bing Lee, Harvey Norman etc. This is a great basic dab radio.I live in Berowra on the outskirts of Sydney and was nervous that I would not get decent reception.But the first scan picked up all the Sydney radio stations and the sound quality is clear and bright.Very easy to set up and I didn’t need to look at the instructions .